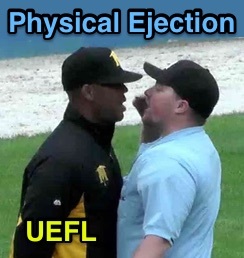 A CanAm League ejection and bench-clearing incident precipitated by a balk & catcher's interference no-call featured an animated discussion between umpire Tyler Thurmond and Miners Manager Bobby Jones, much finger pointing, and a helmet thrown from the dugout at the home plate ump during, what Sussex County promotes as, Family Fun Sunday. Oh, and the benches cleared, too. Video: Jones & Thurmond argue a call. With two out and two on (R1, R3) in the bottom of the 8th inning of the Ottawa Champions-Sussex County Miners game, Miners batter Christian Correa took a 1-1 pitch from Champions pitcher Tyler Knigge for a called second ball, resulting in argument and ejection as Miners Manager and 3B Coach Jones contended that Champions catcher Tyler Nordgren had interfered and/or that Knigge had balked. Replays indicate that while Knigge legally completed his delivery through release from the pitcher's plate, catcher Nordgren stepped in front of home plate without possession of the ball, and caught the pitch entirely on the infield side of the front edge of home plate; this is catcher's interference, the call was incorrect. At the time of the ejection, the Miners were leading, 11-10. The Miners ultimately won the contest, 12-11. Related Yet Different: Earlier this season (May 6, 2018), Blue Jays pitcher Marco Estrada delivered a 0-2 pitch to Rays batter CJ Cron as baserunner R3 Mallex Smith attempted to steal home. Replays indicate that Blue Jays catcher jumped the delivery and caught Estrada's pitch before it travelled through the strike zone, and, in doing so, interfered with Cron's opportunity to receive Estrada's pitch. Although this should have resulted in a balk and catcher's interference ruling pursuant to Official Baseball Rule 6.01(g), it was incorrectly ruled a legal pitch (a called first ball, even though the pitch was located in the strike zone [not legally, just positionally]), and an inning-ending caught stealing. Related Post: Case Play 2018-3 - No Strike, No Balk, No Steal [Solved] (5/10/18). If, as in the Thurmond/Jones ejection CanAm play, the runner from third did not try to score (and the defense merely thought [incorrectly] that the runner was trying to steal), this is catcher's interference, but not a 6.01(g) balk since the rule's chief criterion ("trying to score") was not satisfied. CI occurs when a fielder "hinders or prevents a batter from hitting a pitch" (Definitions/Interference), while a pitch is "delivered to the batter by the pitcher." If the catcher interrupts completion of a pitch by preventing the ball from getting to the batter, it is catcher's interference because the batter has been deprived of his free choice. Raw: Miners vs. Champions game takes an interesting turn as Bobby Jones gets ejected (SCM; 3:19:26).